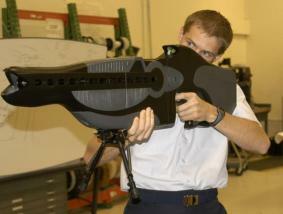 Several prototype PHASR weapons are being tested by the US military. The Personnel Halting and Stimulation Response device is under development at the Air Force Research Laboratory's Directed Energy Directorate. The PHASR has been designed as a non-lethal, man-portable deterrent weapon. It uses a laser system with two different wavelengths to blind (temporarily!) the enemy. Laser weapons that could blind were banned under a 1995 UN convention - the Protocol on Blinding Laser Weapons. The PHASR is intended to dazzle an enemy; it is also being fitted with a range-finding device to make sure that the amount of energy received is not too bright. Obviously, the PHASR name is a retrofit to a sci-fi standard; namely, the phaser used on generations of Star Trek episodes. 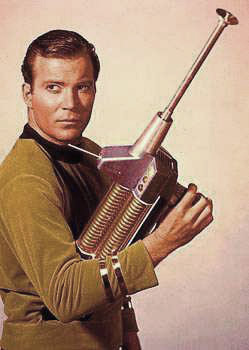 Captain Kirk is shown above with a phaser rifle. In the fictional world of Star Trek, "phaser" stands for "phased energy rectification." In the original series, phasers had several different settings - from stun to kill to vaporize. If you like the PHASR or the phaser rifle, you'll love a somewhat more powerful fictional weapon - the Electrolux Death Ray. Read a bit more here and here.